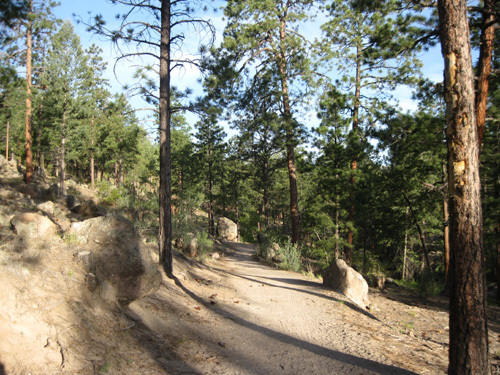 "The Los Alamos County Trail Network, along with routes in the surrounding Santa Fe National Forest, offers hikers, runners, mountain bikers, and equestrians more than 75 miles of trail to explore. 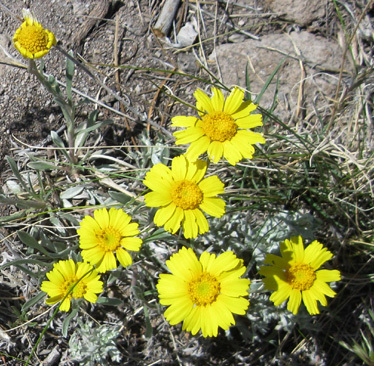 Trails range from 5,400 feet in White Rock Canyon to 10,454 feet at the summit of Caballo Mountain. 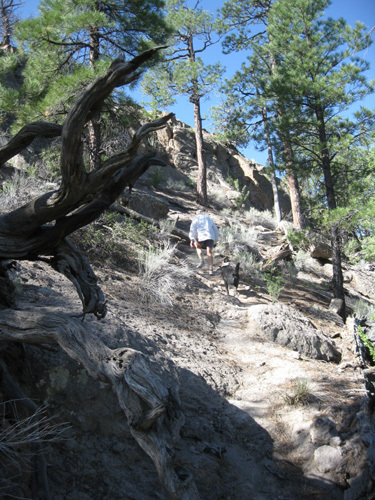 Most trails are easy to follow, but may be rough, steep, and challenging for all trail users . . . "
We did our best to run as many of those miles as we reasonably could while we were in Los Alamos. 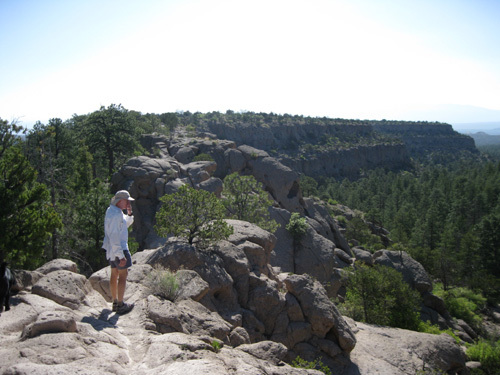 With the Jemez Mountain Trail 50-miler just a week after our arrival, however, Jim had to watch how much he ran. He was in taper mode. 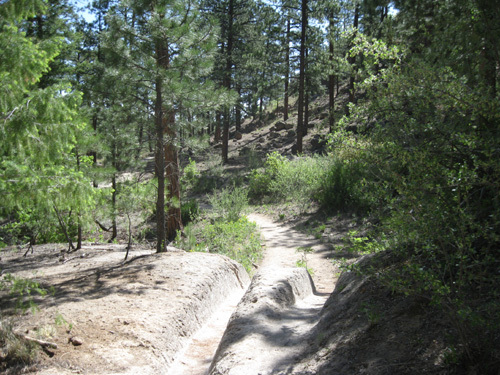 But he also wanted to see some of the trails on the race course, which begins and ends with some of the city's open space trails before heading into the mountains and over 10,000 feet three times. 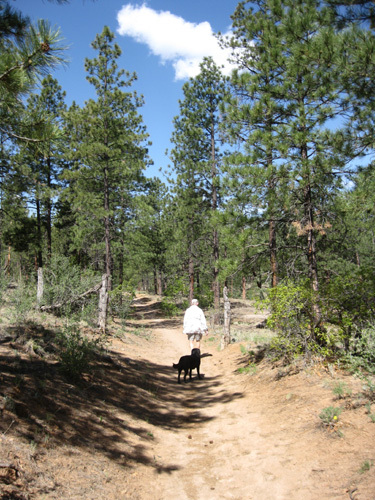 He'd end up getting a wide sampling of the variety of trails in the Los Alamos area before our departure. 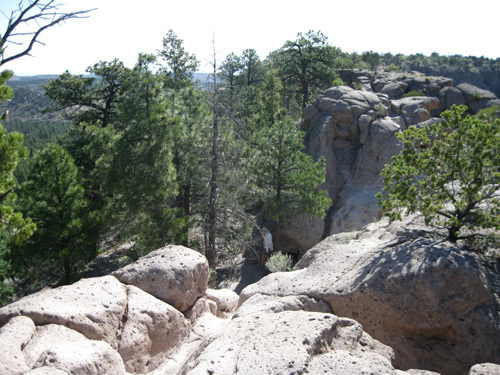 Because of my deteriorating knees, I limited the miles I ran and walked on gnarly mountain trails around Los Alamos. 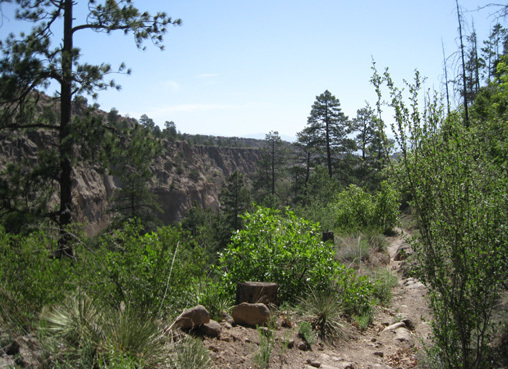 After checking out part of the Mitchell Trail to Guaje Ridge, I found enough challenge in running several of the trails within the city limits that traverse the mesas and drop down into the steep canyons. 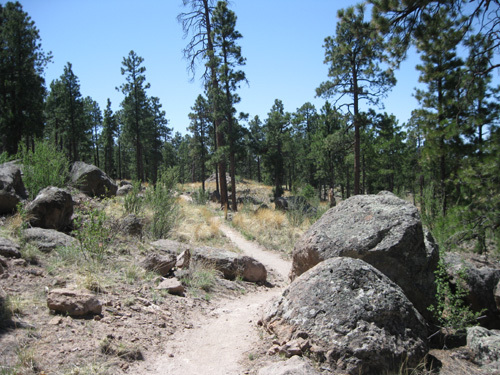 I'll briefly describe some of these trails and show photos in this two-part series, beginning with the open-space trails and morphing into trails used in the Jemez Mountain races. The map above is from the www.visit.losalamos.com website. I realize it's 'way too small to read here but it'll give you an idea of how the mesas (in green) and canyons (tan color) relate to each other. Trails are dotted black lines. This copy is a .gif file so it may not translate as well online as a .jpg one. This is the only trail in the network where we managed to get "lost" briefly. 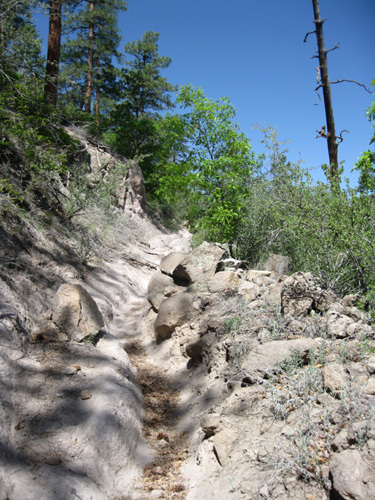 I was hunting for a fairly level, smooth trail for a long run in my training buildup for the Bighorn Mountain Trail 50K in mid-June. 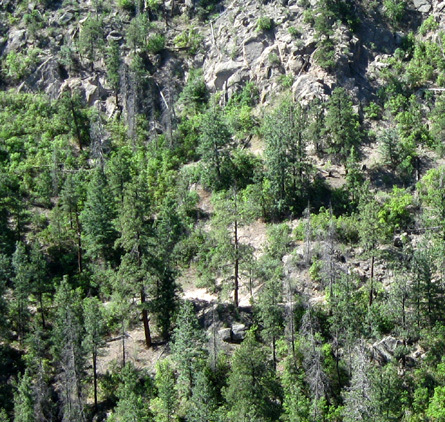 So far, all we'd found were fairly hilly, rocky trails. The description of Deer Trap sounded good: a trail rated "easy" and promising continual spectacular views along the mesa top for 2.6 miles. That would work; I'd just run and walk the Y-shaped trail out and back for several hours, using our truck as an aid station. We enjoyed the drive on Barranca Road to the trailhead at Deer Trap Mesa, one of two long fingers of land that extend beyond Barranca Mesa. What a nice neighborhood! 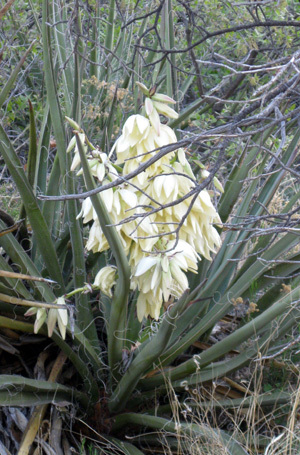 Not only are the houses and yards attractive, there are also several trails that access Bayo and Rendija canyons. 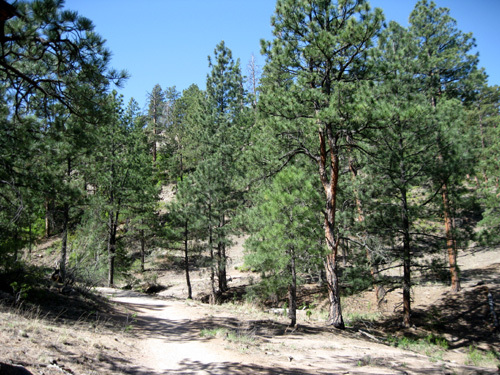 Every trail runners' dream: living in close proximity to an entire network of great trails! Unfortunately, we had difficulty following the correct path about a quarter mile past the Deer Trap trailhead. Abrupt break in the rocks: OK, now where do we go?? We dropped off the mesa per the directions, heading for the only trail we could see, but failed to go back up as soon as we were supposed to. 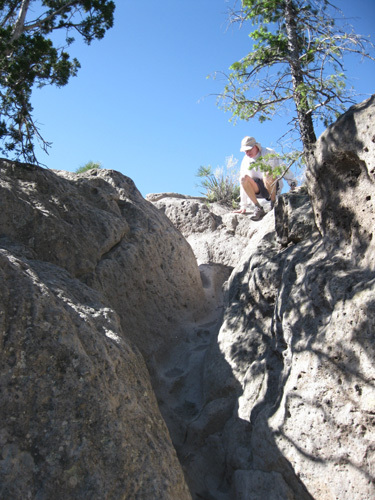 We continued on the only trail we saw, a narrow, canted path on the steep north slope of the mesa. It was nearly impossible for me to walk, let alone run, on the loose rock and dirt with my weak ankle on the downside of the trail. Jim wasn't having any fun, either. The man pointed out the correct path on top of the mesa but by then we'd had enough of this trail. Because of the two steep ascents/descents we'd already discovered that were required on each loop, it wouldn't do for my long run. 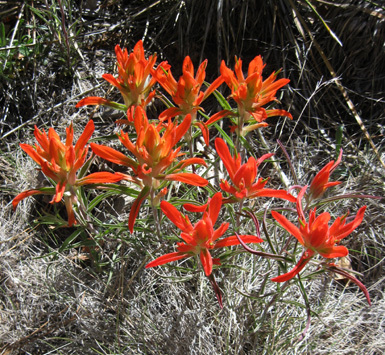 I asked the hiker about a smoother, flatter trail and he immediately recommended one on the next mesa to the south: the North Bayo Bench Trail. 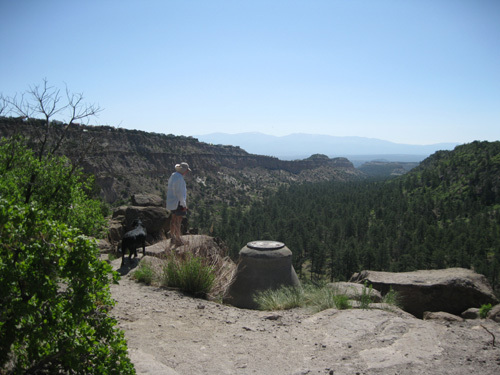 We headed that way, but not before I had my fill of the gorgeous views from Deer Trap Mesa! That part of the description was spot on. (see first photo in entry). 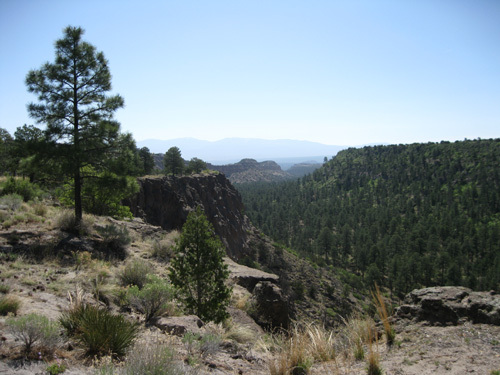 Bayo Canyon runs for miles between Barranca and North Mesas and off to the east of Los Alamos. 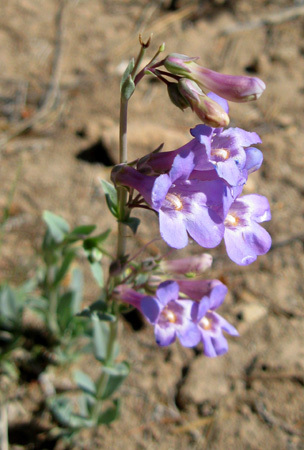 There is an interesting network of trails along both canyon walls and down in the bottom of the canyon itself. Wow! 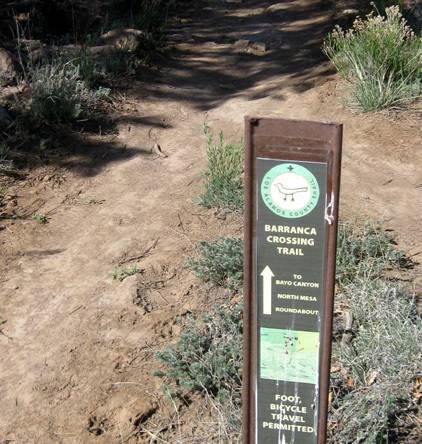 The bench trail was exactly what I was looking for: a mostly-smooth, wide, undulating trail with awesome views into Bayo Canyon and east to the Sange de Cristo Mountains. turned around, and retraced our steps back up to Barranco Mesa. 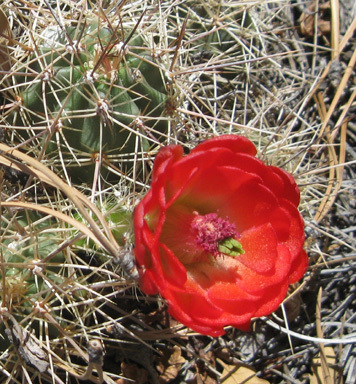 Out and back from the main trailhead to the overlook on the popular bench trail is 3.4 miles. I extended the distance by doing a loop toward the other side of the canyon on each out and back. 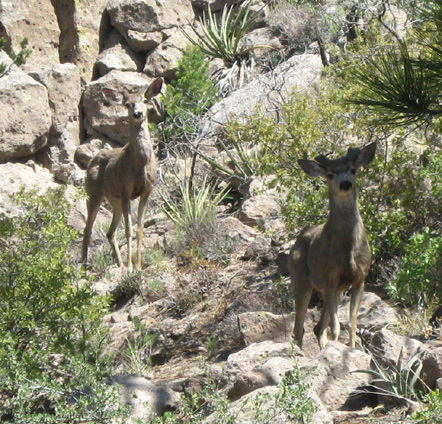 It's part of the Bayo Canyon system of trails and doesn't have a separate name on either of our trail maps (the locals probably have a name for it). 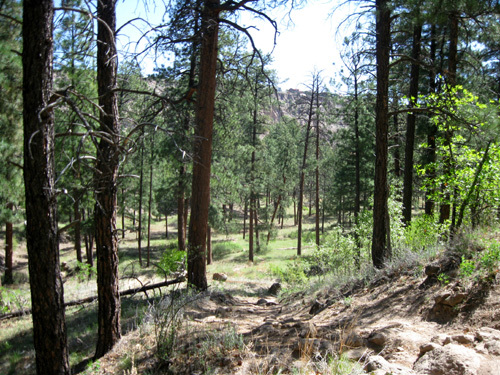 Part of it is used at the beginning and end of the Jemez Mountain race. 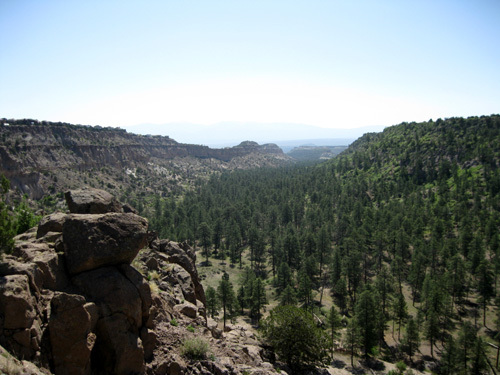 I circled around the point of the mesa and hiked up a steep, rocky trail that brought me back to the North Bayo Bench Trail, near the overlook. If I had needed additional mileage I could have followed any of the four trails extending east through Bayo Canyon for many miles. 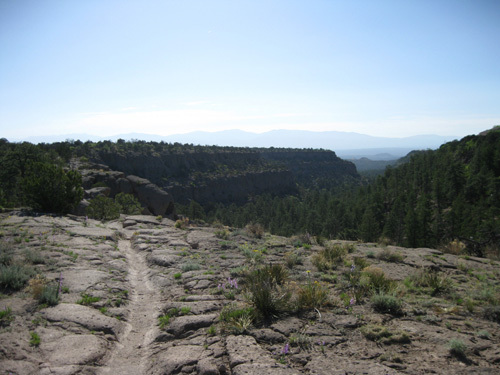 The trail on the side of North Mesa is fairly smooth for about a mile (the part included on the Jemez Mountain race course), then becomes more narrow and rocky as it drops into the canyon. The trail I took to get back up to the North Bayo Bench Trail is also pretty gnarly. Most of the miles during my long run were on smoother sections. I ran on the smooth North Bayo Bench Trail three times, all on weekday mornings when only a handful of other runners, hikers, and cyclists were using it. It's much busier on weekends. in the early 1900s, then further eroded by people walking on the trail. I ended my long run several days ago with a couple of miles along the Dot Grant and Woodland trails in Rendijo Canyon, also accessed from the Bayo Canyon Trailhead at the roundabout. I wasn't sure which of the trails Jim would be running in his race but showed him photos of each so he could see how nice they were. 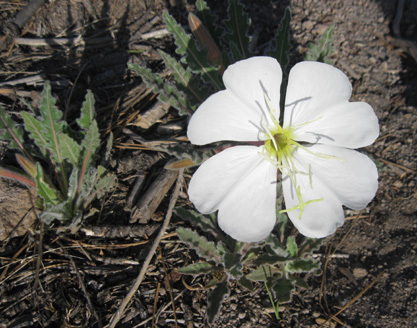 Because of the large number of trail photos I'm including, this topic is continued in the next entry.